This is part of larger series on carbon fiber (CF). If you are just joining this blog now, please take a moment to review the previous CF posts. For our regular readers, we will soon be switching topics to early 20th century concrete formwork repair for a real change of pace that mixes 19th century construction techniques and the imprint of the original timbers in early concrete construction to discuss how damaged areas can be repaired unobtrusively. 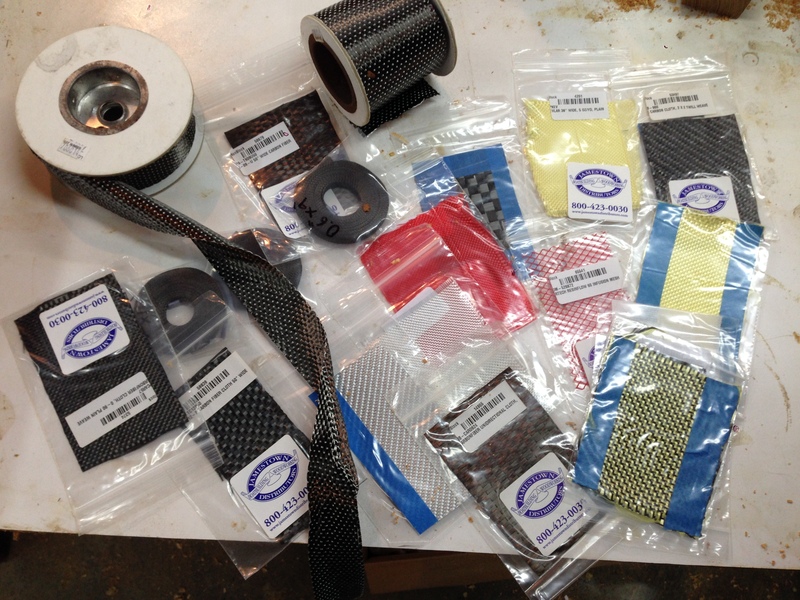 In our initial attempts to determine which CF cloths and resins to use, we reviewed a lot of technical literature. Too often though it was focused only on the how-to of layup for specific uses in industries such as boats or airplanes. Nowhere was it articulated why one type of weave or directional cloth was used in each part or function so that we could determine the best materials for the types of stresses we would be placing on our artifact supports. As a designer, I needed the fundamental information on how the woven textile system works so that I could apply it to the particular problems we faced on this project. The best information – that which broke the logjam for us – was not listed as a technical book. Rather it was a coffee table book resulting from an exhibit at the Cooper Hewitt a few years earlier and that was edited and largely written by textiles department exhibitions curator Matilda McQuaid. I can’t recommend the book enough to anyone interested in learning to work with carbon fiber in non-standard ways. Extreme Textiles: Designing for High Performance concisely explained why each material, weave, and directional choice is chosen for hundreds of uses across dozens of industries from machine parts to surgical implants, from lunar landing pods to buildings of woven structural elements. “As composite reinforcements, textiles offer a high level of customization with regard to type and weight of fiber, use of combinations of fibers, and the use of different weaves to maximize the density of fibers in a given direction. Fiber strength is greatest along the length. The strength of composite materials derives from the intentional use of this directional nature. While glass fibers are the most commonly used for composites, for high-performance products the fiber used is often carbon or aramid, or a combination of their two, because of their superior strength and light weight. For an architectural conservator, I also appreciated how this book put the use of textiles in the historical context of man’s earliest permanent dwellings with wattle and daub and then went on to cover the last hundred years from the early 20th century attempts to design multilevel interwoven cities by the likes of Buckminster Fuller and right up through modern construction using lightweight, flexible armatures to support glass and and other cladding far heavier than the frame. “While many [modern curtain wall structures] depend on highly advanced materials and technology, the principles have ancient roots using humble fabrics. Recent archaeological finds date the beginnings of permanent construction almost immediately after the last ice age, approximately seven thousand years ago, contemporary with tearless evidence of woven textiles. As the nomadic existence of the Paleolithic age gave way to the first settlements, and transportable tent like huts clad in animal skins were replaced by architecture designed to last for generations, the first building materials to emerge were not masonry, but woven. A meshwork of small, flexible branches formed the under layer of cladding and served to brace the larger structural members, stiffening the then-circular house…. Most traditional buildings engineered today use components of construction fabricated in a strict order…The order of construction is roughly parallel to a steady decrease in size of each element, and in the hierarchy of support. Each must carry the combined load of every subsequent element that is later added to it. The first stages of construction therefore form the immovable, stable base that supports everything that is to come. As stated in the introduction to carbon fiber I wrote for the Menokin project engineers, my decision to look into the use of reversible carbon fiber armatures had come from discussions with Chemist Richard Wolbers regarding my concerns about the lifespan of components such as epoxy resins normally used to impregnate the artifact and act as a consolidant. We have long justified the use of epoxy consolidants when we would lose the artifact and all of its information if we did not use modern resins. But it seems to me that it is now time to move away from irreversible impregnation of artifacts wherever possible, especially given that the resins we have been using often have a shorter lifespan than the artifacts that we are purporting to save. Following on this rationale, we realized that if the carbon fiber could act as a reversible support, then if the adhesive failed, the support could be removed without affecting the object. Our stress testing to failure had shown the weak spot was within the wood itself. The failure was never within the carbon fiber or in its bond to the wood. In other words, the epoxies and the carbon fiber are far stronger than the wood. But the further we revised our designs, the more we realized that in many cases the CF prosthesis does not necessarily need to be bonded to the artifact. It just needs to be held in place. When bonding to the artifact was necessary, it could be adhered with an easily-reversible thermoplastic resin that a hair dryer could release. In addition to the structural supports designed for the woodwork at Menokin, we also realized there might be uses for the infinite variety of weaves, ropes, composite fibers using Kevlar and aramids, etc. in the stabilization of the masonry as well. Our first use of carbon fiber on the building came on one of the main four-flue chimneys. This chimney had a vertical crack running from the top down to just above the second floor mantle height. We knew gravity would pull more debris into the crack as the masonry swelled and shrank through seasonal movement. The debris from shattered mortar in a crack works its way down, essentially further jacking the crack open and restricting it from closing back up. The colony of pigeons vying for position on top of the chimneys wasn’t helping the situation, but in spite of the alarming appearance of the top of the chimney on two sides, all of the flue dividers were intact. 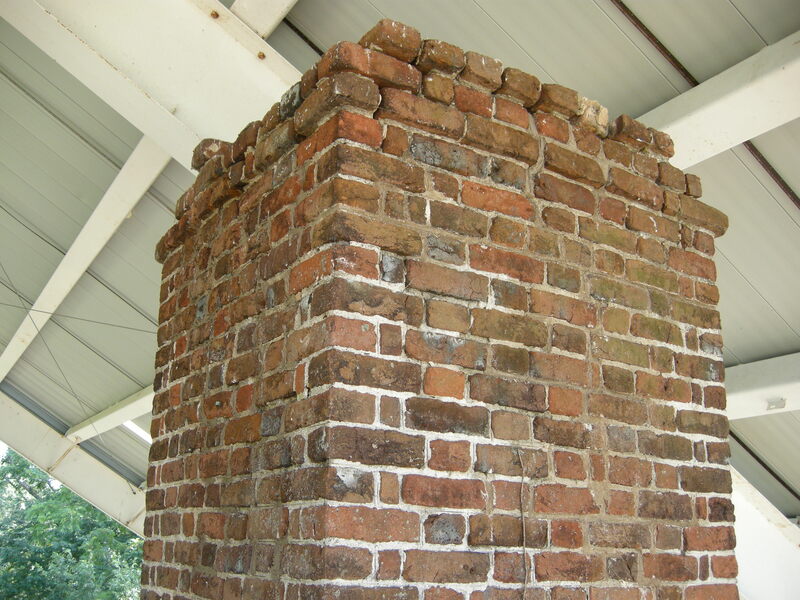 Aside from the crack and the top few courses of brickwork that had received the most severe weathering, the original mortar in the chimney was quite sound in spite of 230 years of non-existent maintenance. Straps around the chimney for interim support. Adding angle iron to the corners between straps further improves restraint. We had banded the top of the chimney while excavation and stabilization had continued below. Now, after addressing the problems that had caused the original crack to start, we decided the best approach was to leave the chimney crack where it was, but to repoint along the line of the failed mortar at the crack. Wedges of rolled lead were used to secure the carbon fiber in the joint until it could be pointed. While the chimney masonry was not particularly out of alignment or beyond its tipping point, we decided to provide a bit of additional restraint by laying carbon fiber into several joints around the exterior. This included “stitching” every few courses across the crack as well as wrapping the full perimeter of the chimney at three locations. One thing that is hard to see in these photographs is how we secured the ends during a full perimeter wrap of the chimney. 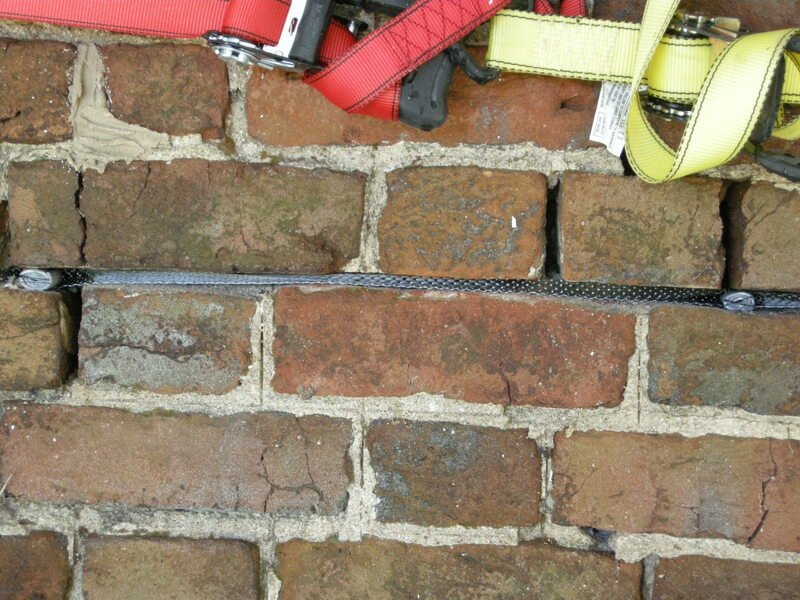 The carbon fiber coming around at the end was lapped over itself in the joint about a foot before one end was turned up and the other was turned down and then wrapped back the alternate direction around bricks into the course above and below, essentially creating a lock. Because the building is being interpreted as a ruin, we opted not to infill missing brick, but did mortar around loose brick at the top. Unsure what the working characteristics of the somewhat “sticky” carbon fibers would be against rough masonry, we tested both a 2” wide woven tape and a 3k-strand “rope” known as tow. The spooled tow was significantly easier to lay into the joint, but it did also tend to catch on the rough edges of the irregular masonry. As we pointed over the CF, the chimney began to take on a new appearance. (Wet mortar appears brownish). With the 2” tape, we folded it in half in the joint, using the lead wedges to hold it open in a C that we could pack with mortar. This was difficult to lay into place with a single person in the bucket lift, but may have created a more durable fit than the tow. Of course the goal here was not to “freeze” the chimney since it would still want to move seasonally. Rather we wanted a minimal restraint against any additional tendency to move outward. For those who are interested, these videos show the conditions and work in progress. The Virginia earthquake that followed our chimney repair two years later confirmed that this methodology was sound. 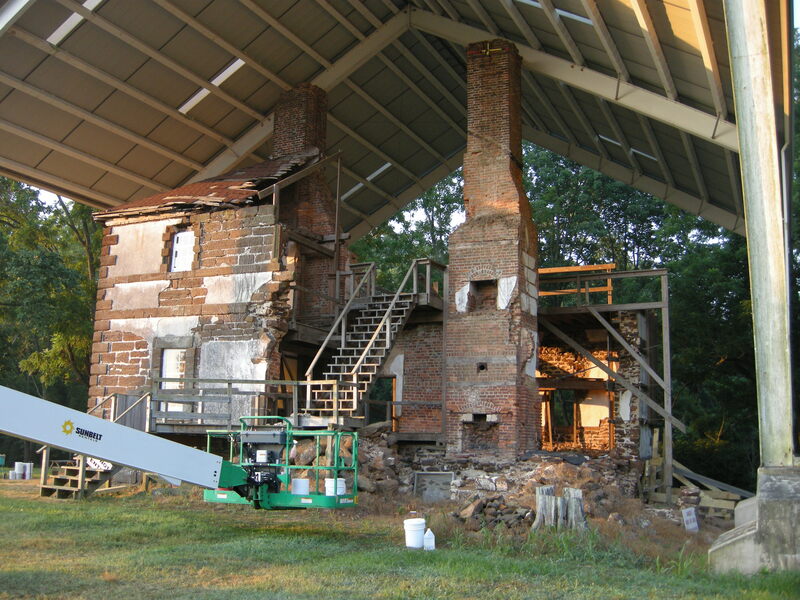 With chimney failures throughout the region after that shaking, many engineers ordered that chimneys and walls with limited damage be dismantled and rebuilt. But our stabilized Menokin chimney survived intact. We were looking at lots of buildings in the region after the earthquake and an aside to this story is that most of the damage that occurred with historic masonry was directly related to where modern hard materials had been inserted as infill into flexible historic masonry. Remember that the main function of lime mortar is to cushion masonry units thereby distributing loads evenly. For example, where chimneys above the roofline were rebuilt in portland they hopped off onto the roof, at the National Building Museum, the historic masonry around every altered doorway cracked from the hard infill while the rest of this nearly city block square building was otherwise unscathed, and the project we were preparing to start nearby (the object of our next blog post) saw damage occur around the tower’s circular windows due in large part to extreme deferred maintenance. Before we continue on to discuss our plans for creating through-wall bonding stabilization of the rubble walls at Menokin, in our next post we will deviate to another project where we used the folded carbon fiber tape in masonry joints on a larger scale than was required for the Menokin chimney. We referred in this post to the masonry not being past its tipping point and therefore eligible for stabilization in place rather than realignment or relaying. 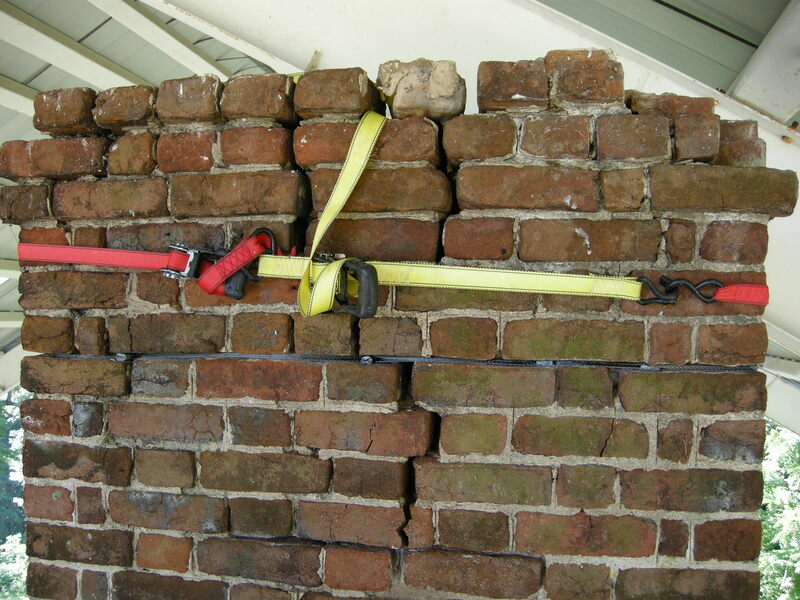 For those who are interested in better understanding when masonry should be deemed unstable, check out this informative blog post. 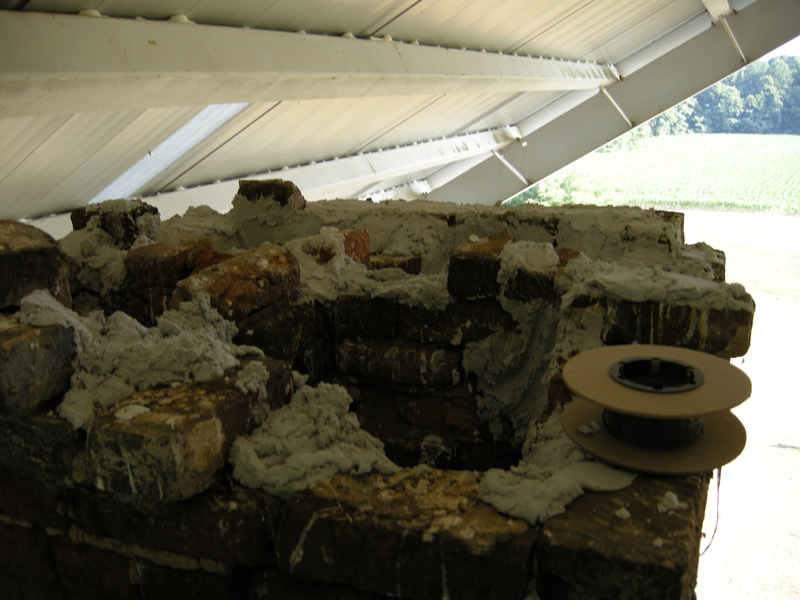 This entry was posted in Composites, Masonry Stabilization, Mortars and tagged carbon fiber, carbon fiber prosthesis, chimney repair, chimney stabilization, earthquake stabilization, Engineer Tim Macfarlane, Menokin, Menokin Glass House, preservation. Bookmark the permalink.